Staining concrete is a technique that has been practiced for decades to achieve different textures and colors on traditional concrete and cement surfaces. From water-based acrylic stains to acid-based staining, there are a lot of different things to take into consideration when thinking about a concrete staining project. Staining will allow you to completely explore your artistic visions for your property and visit the broad range of colors available. Here at Concrete Contractors Fort Smith our contractors will apply expert precision from surface preparation, application and sealing of the concrete. It can be a very challenging thing to tackle without experience as it helps to know the properties of the different chemicals that are needed. It also helps to consult a professional because there may be more options available to you that you don't even know about! Often our contractors are able to blow expectations out of the water! There are two main basic types of staining you can utilize for concrete floorings; water-based acrylic stains and acid-based stains. There is nothing more dull or boring looking than a concrete wall or surface in a home with the original gray look, why not spice it up and create a completely unique look with concrete staining, something we specialize in at Concrete Contractors Fort Smith. Some people will use paint on a concrete surface but it doesn't work out that well in the end because the concrete it porous so the paint can't adhere properly. Staining, however, will penetrate the concrete and make the new color and textures a permanent part or your surface by physically altering the chemical structure. The main components of an acid based stain are water, hydrochloric acid, and metallic salts, which produce more earthy and dark tones in your concrete. Water-based acrylics are used when you want a wider range of colors, although this method only penetrates the top layer of the concrete. Staining concrete is one of those jobs that can turn out completely different than what you were expecting if each of the steps wasn't followed properly. If you are looking for staining on your garage floor, patio, walkway, deck, pool deck or sidewalk you may have difficulty achieving the beautiful look you are searching for yourself if you haven't done it before. The different chemicals used during the staining process all have properties that you are best to be familiar with if you plan on working with them. A professional with years of experience will be able to utilize these chemicals safely and create a surface you could only dream of. 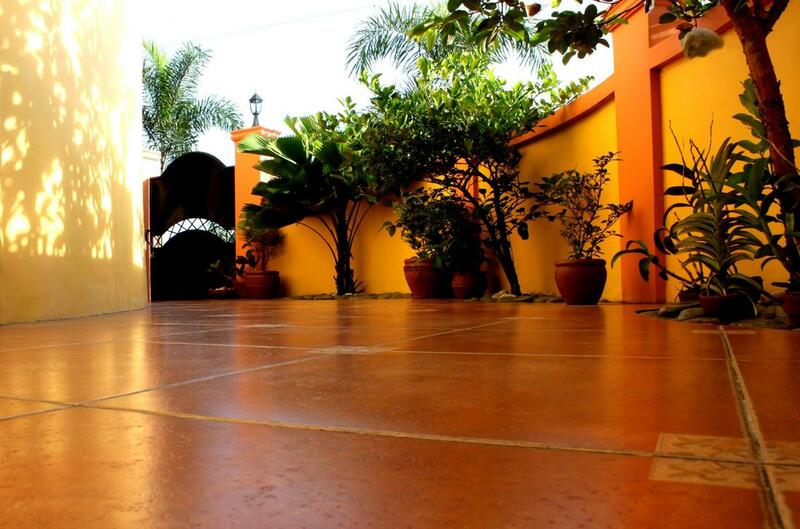 ​Give us a call today if you would like to discuss your concrete staining options. This is a type of job that we can usually quote very quickly depending on what you want to have done because it is based on square footage and the type of stain that will need to be used to accomplish the desired end result. We will work with you can determine exactly what you may want for your surface and schedule a time that works best for you! You will be happy you called Concrete Contractors Fort Smith for your concrete needs!